July 8, 2009 – Business doesn’t give enough credit to people – literally and figuratively. The innovative Bangladeshi banker Muhammad Yunus, speaking to the press this afternoon at the Nelson Mandela Foundation, believes human beings aren’t happy simply to pursue the goal of profit. “I propose businesses that have a positive impact on other people and on the environment,” said Prof Yunus, who founded Grameen Bank, a microfinance institution, because “a third of the world’s population remain outside the credit of traditional banking”. 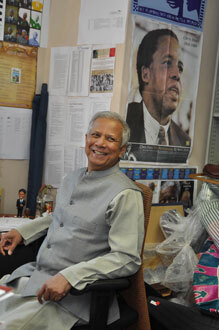 Prof Yunus was introduced by the Foundation’s CEO, Achmat Dangor, who said it was appropriate that the Managing Director of Grameen Bank was delivering this year’s Nelson Mandela Annual Lecture, given the global economic crisis. “His address comes at an appropriate time: with the world in economic turmoil, finding new ways of doing business and looking at ways of eradicating poverty is key,” Dangor said. Prof Yunus spoke about his work to eliminate poverty as well as his ideas about business, saying that he was happy to be in South Africa at a time when people were looking for a new way forward. He highlighted the fact that while businesses had fantastic technology at their disposal with which to tackle the world’s problems, the drive to make profits prevented them from using these technologies to help people. The session was then opened to the floor and Prof Yunus spoke about the potential shortcomings of microfinancing, the need for governments to create enabling environments rather than welfare states, and Mandela Day. 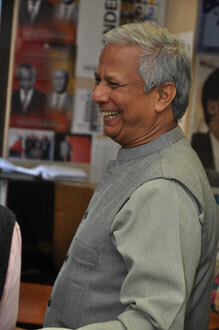 There are microfinancing institutions around the world, said Prof Yunus. There are no differences in markets, so if microfinancing as a practice is unsuccessful in some areas of the world, it’s not that the concept has failed but rather that the application has not been good. The important thing, he continued, is for governments to create access to fundamental human rights. Welfare states make no sense, he argued; you cannot expect governments to hand out food to people indefinitely. Instead, what they should be doing is making it possible for people to take care of themselves. Overcoming human apathy as well as skills shortages, said Prof Yunus, was a process that would take time, but one that would be ultimately successful once people saw their neighbours being able to feed and educate themselves through entrepreneurial ideas which were financed by microlenders. When asked about the inherent risk of lending to the very poor, Prof Yunus laughed, saying that the risk profile had been turned upside down. Prof Yunus said it was “appropriate” to celebrate Nelson Mandela’s birthday, July 18, by introducing the Mandela Day initiative, which encourages ordinary people to do what they can to make the world a better place. Speaking of his own plans, Prof Yunus – who received the Nobel Peace Prize in 2006 – said he would be continuing his work to eliminate global poverty. Closing the press conference, Dangor encouraged the media to do their bit for Mandela Day. Prof Yunus gave a few interviews before being given a tour of the Foundation and its Centre of Memory by the Head of the Memory Programme, Verne Harris.